Since exercise and saffron (containing crocin) are available in the majority of human societies, this study was designed. Moreover, although some studies have been conducted on crocin and exercise alone on stress conditions, no published report is yet available on the effects of unpredictable stress (one of the most stressful conditions in human society) with each crocin and exercise alone as well as unpredictable stress with crocin-accompanied exercise on memory processing. The present study was, therefore, designed to investigate which one(s) of crocin, exercise and/or crocin-accompanied exercise is/are effective on learning, memory, and memory consolidation in rats under chronic unpredictable stress (CUS). Forty-eight male Wistar rats (200–250 g; n = 8) were obtained from the Pasteur Institute (Tehran, Iran). All the experimental protocols were approved by the Ethics Committee of Isfahan University of Medical Sciences (Isfahan, Iran) in compliance with the “Principles of Laboratory Animal Care” and the European Community Council Directive of 1986. Rats were housed (4 rats in each cage) under standard laboratory conditions with a 12 h light/dark cycle (lights on at 07:00–19:00.) at a constant temperature (22°C ± 2°C). Food and water were available ad libitum. Animals were allowed a 2-week period to adapt themselves to the environment. Behavioral experiments were carried out between 13:00 and 15:00. 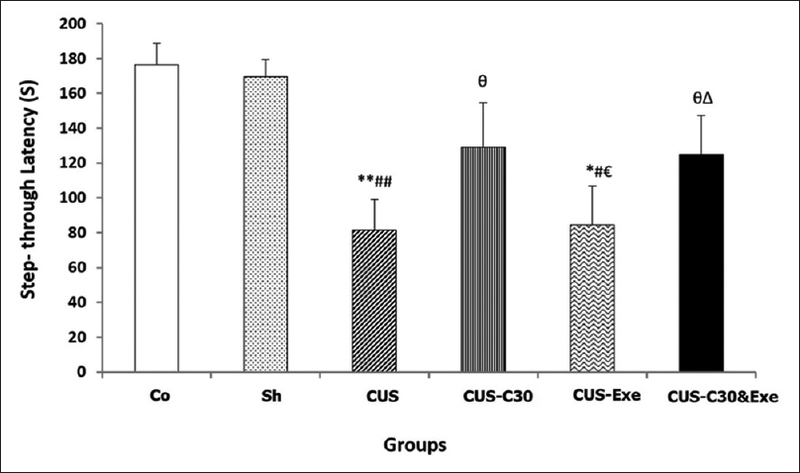 Chronic unpredictable stress-Crocin30-exercise group: (CUS-C30 and Exe): Rats were under unpredictable stress for 2 h/day and daily received crocin 30 mg/kg (before stress) and were subjected to exercise (1 h/day, after stress) for 21 days [Figure 1]. In the current study, CUS was randomly induced in the rodents. Each day, rats were subjected to one of the below stressors in an unpredictable order. The stressors included different types of stress as follows: restraint stress (rats were placed in a restraining device made of Plexiglas), heat stress (rats were placed in glass cage in a warm environment 40°C–42°C), elevated platform (rats were placed on a platform elevated about 1 m above the ground), cold stress (rats were placed in plastic cage in a cold environment 2°C–4°C), water immersion stress (rats were placed in a Plexiglas filed with water temperature about 22°C–24°C), isolated stress (rats were moved to individual cages), and crowded stress (rats were housed 10 rats per a standard cage). The control rats were housed under similar conditions but left undisturbed during the stress period. The CUS was randomly induced in the rodent throughout the experimental period each day, at 8:00–10:00 am 2 h/day for 21 consecutive days. 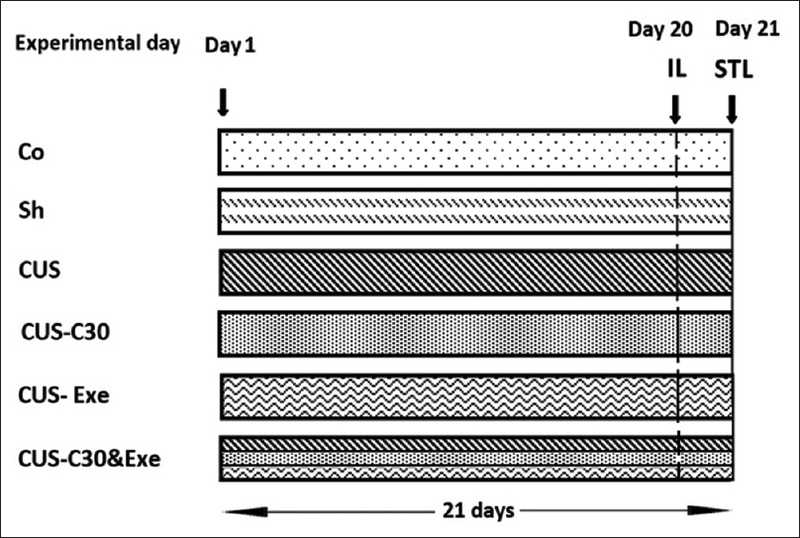 The animals received doses of 30 mg/kg of crocin (Sigma-Aldrich Co., USA) dissolved in saline, intraperitoneally injection for 21 consecutive days in the unpredictable stressed rats. Rats in the exercise group run on a treadmill at a speed of 20–21 m/min for 60 min daily (1 h/day) for 21 days., To familiarize animals with the treadmill set up, its speed was increased from 10 to 21 m/min and over the course of 3 days. In the current study, learning, memory, and memory consolidation were measured by the passive avoidance test as one of the behavioral tasks. The passive avoidance apparatus (64 cm × 25 cm × 35 cm) was divided into same size room (32 cm × 25 cm × 35 cm) that had a grid floor. The two rooms were separated by a sliding guillotine door. On day 19 of the experiment, each rat was placed in the apparatus for 300 s to habituate to it. On the day later (day 20), a single learning trial was performed. Then, on day 21, the memory trail of passive avoidance test was evaluated. Both habituation and memory trail were without any electrical foot shock. In the learning trial, rats were placed individually in the ligh troom for 60 s, then the guillotine door was raised. When the rat entered the dark room, the door was closed and a single foot electrical shock (0.5 mA, 2 s; once) was delivered through the grid floor using an isolated stimulator. The initial latency (IL) of entrance into the dark room was recorded before inducing an electrical shock. Also, in the memory trial, the step-through latency (STL) as the delay of entering to the dark room from lightroom (up to a maximum of 300 s) was measured. Furthermore, the trend between IL and STL indicated that learning was happened in animal experimental research. The total dark stay (DS) time was recorded as memory consolidation and/or storage of novel information. The passive avoidance task determined the ability of the animal to remember the foot shock received. Avoiding entry into the dark compartment or a longer duration of stay in the light compartment was interpreted as a positive response. Since not all of the behavioral data in the passive avoidance test were normal, nonparametric tests were used. IL, STL, and DS time (between groups) were compared using a Kruskal–Wallis nonparametric one-way analysis of variance (ANOVA), followed by a two-tailed Mann–Whitney U-test with groups as the independent variable and performance in each session as the dependent variable. The comparisons of initial and step through latencies (within groups) were analyzed by Friedman test, followed by a Wilcoxon signed ranks test. All the data were reported as standard error of the mean P < 0.05 was considered statistically significant. 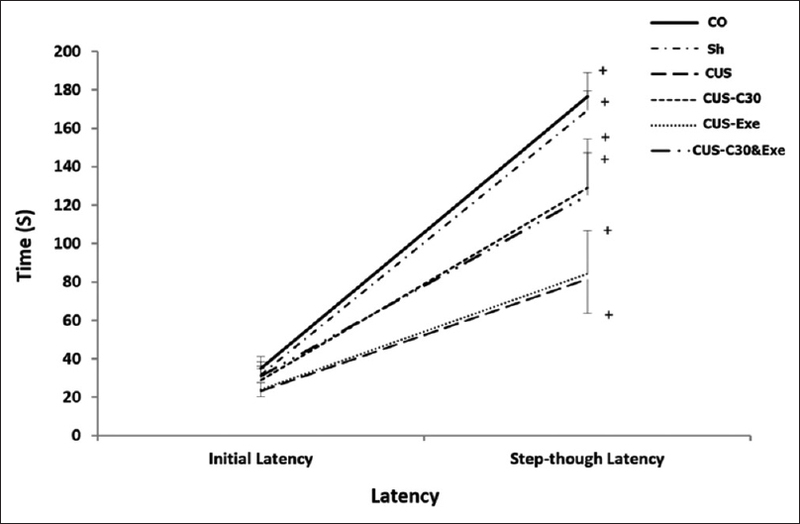 [Figure 2] and [Figure 3], respectively, show the initial and stepthrough latency (IL and STL, respectively) of all groups in a single-trial passive avoidance test. Results showed that there were no statistically significant differences between control (Co) and sham (Sh) groups in the IL and STL, suggesting that the injection had no significant effect on these parameters. In addition, based on the other results, the IL did not show significant differences in all groups [Figure 2]. The STLs were significantly (P < 0.01 and P < 0.05, respectively) lower in the CUS and unpredictable stress-exercise (CUS-Exe) than the control group [Figure 2]. Whereas, the STLs show no significant decreases in unpredictable stress-crocin (CUS-C30) and CUS-crocin 30-exercise (CUS-C30 and Exe) compared to the control group [Figure 3]. As shown in [Figure 3], the STL in the CUS-Exe had not significant enhancement compared to the CUS group, indicating that exercise did not have a considerable effect on memory deficit induced unpredictable stress. Moreover, the STL significantly (P < 0.05, in both them) increased in CUS-C30 and CUS-C30 and Exe groups when compared to the CUS group [Figure 3]. According to other present data, the STL was significantly (P < 0.05) lower in the CUS-Exe group than the CUS-C30 [Figure 3]. It indicated the positive effect of crocin compared to exercise in unpredictable stress conditions. 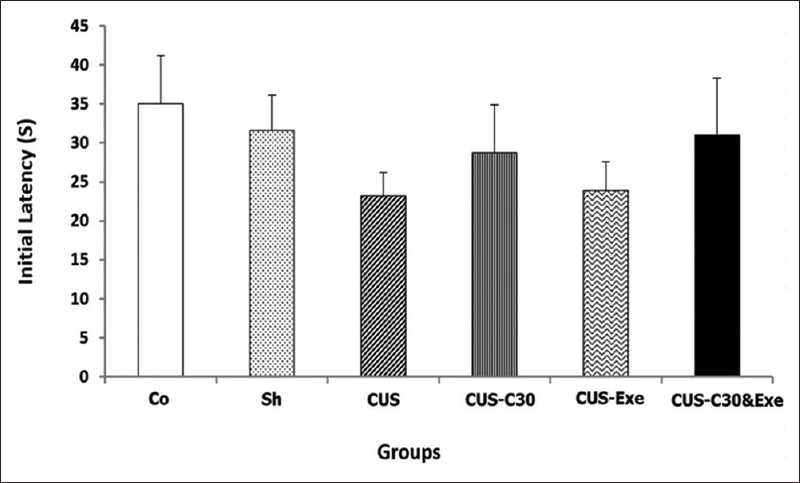 Whereas, the STL did not significantly differ in the CUS-C30 and Exe compared to CUS-C30 group [Figure 3], indicating that exercise accompanied with crocin had not synergic effect on enhancement of memory in stress rats. As presented in [Figure 3], the STL was significantly (P < 0.05) higher in the CUS-C30 and Exe group than the CUS-Exe group. The results showed that chronic crocin treatment improved memory impairment due to unpredictable stress. The IL and STL were analyzed by the two related samples test (Friedman test, followed by a Wilcoxon signed ranks test) to evaluate within-group latency differences. As shown in [Figure 4], significant differences (P < 0.05) were detected between the IL and the STL in all the groups, indicating that learning occurred in all experimental groups at different levels. The Kruskal–Wallis nonparametric ANOVA and post hoc two-tailed Mann–Whitney U-test revealed no significant difference in the total dark compartment stay time (DS) between the Co group and Sh group [Figure 5]. As shown in [Figure 5], the DS in the CUS group was significantly (P < 0.05) higher than that of the Co group [Figure 5], suggesting that exposure to the stress had interfered with ability consolidation of memory. In addition, in the CUS-Exe and CUS-C30 and Exe groups, the DS significantly (P < 0.01, in both them) increased compared to the Co group [Figure 5] while in the CUS-C30 group, the DS did not show significantly enhancement compared to the control group [Figure 5]. 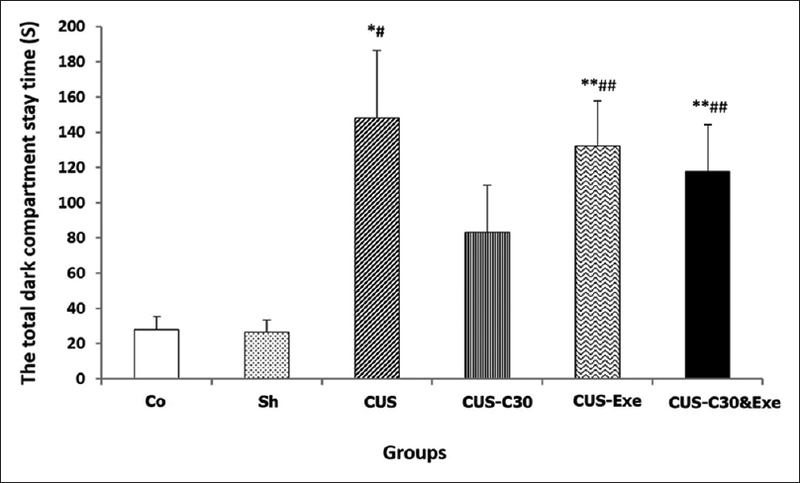 As can be seen from [Figure 5], the DS had no significant differences in the CUS-C30, CUS-Exe, and CUS-C30 and Exe groups compared to the CUS group. The effects of crocin, exercise, and crocin-accompanied exercise on learning, memory, and consolidation of memory in rats under chronic unpredictable stress were investigated in the current study to determine which one(s) of crocin, exercise, and/or crocin-accompanied exercise are helpful for brain functions in rats under chronic unpredictable stress. The results indicated that the CUS induced impairment of learning and memory similar to earlier studies on other chronic stress types. In this regard, many studies demonstrated the deleterious effects of different type of stress on brain functions such as memory, brain activity, gene expressions, and changes of stress biomarkers.,,, According to some previous reports, it seems that stress had various complex effects (impairing, neutral, and facilitating) on memory.,,,, In addition, another result of this study is that the DS time increased in the CUS group, which may reflect impairment of the memory consolidation in unpredictable stress condition. In this way, some studies reported stress changed memory consolidation by adrenal hormonal changes such as glucocorticoid and catecholamine through activation of similar neural systems., Furthermore, it is possible that the basolateral amygdala (as a key structure in a memory modulatory system) and interactions of the different brain regions could influence memory consolidation. Another finding of the present study is that chronic crocin treatment improved the severe harmful effect of the CUS on memory processing including learning, memory, and memory consolidation in the passive avoidance test, but not the same as the control group. Ghadrdoost et al. observed that crocin prevented spatial memory deficit induced by chronic restraint stress in the Morris water maze task. In addition, saffron extract antagonized memory deficits due to scopolamine and streptozotocin-icv, as a model of Alzheimer's disease in the behavioral task., However, it is possible that crocin as a potent antioxidant could improve altering, reversing, or forestalling the neuronal behavioral decrements. Other present finding showed that crocin treatment was able to improve memory impairment due to unpredictable stress compared to the exercise group. It seems that crocin treatment, as herbal medicine, was more effective on memory deficit due to unpredictable stress than exercise. Contrary to our results, a number of studies have shown that exercise improves induced memory disorder by stress. Despite little comparative studies conducted on the effect of crocin and exercise on the physiologic system, there is no study on brain functions in this regard. Ghorbanzadeh and et al. have shown that crocin combined with voluntary exercise improved insulin resistance and angiogenesis as well as reduction of glucose levels in diabetic rats. Therefore, these differences are most probably related to the duration, intensity, and type of stress and exercise (e.g., forced vs. voluntary), task difficulty, gender, and other yet undefined variables., Furthermore, based on the current study, other subjects were also probably involved in differences such as the induction time of stress and exercise, as well as the injection time of the drug. According to the results of the present study, memory did not show any significant differences in crocin-accompanied exercise compared to the stress-crocin group. Moreover, crocin-accompanied exercise significantly improved memory deficit but not memory consolidation due to unpredictable stress, compared to the stress-exercise in passive avoidance test. It indicated that exercise accompanied with crocin did not have a synergic effect on enhancement of memory in stressed rats. Accordingly, it seems that memory improvement in the crocin-accompanied exercise was probably due to crocin, but not exercise, in unpredictable stress conditions. Also, it should be noted that although improvement of learning and memory were observed in the crocin-accompanied exercise and crocin groups in unpredictable stress condition, but the level of memory did not reach to the control group. It probably confirms the type of stress is very important in contrast to the response to different treatment. In addition, unpredictable stress was found as one of the destructive stress types. To sum up, unpredictable stress had very devastating effects on memory and memory consolidation. The chronic crocin treatment improved the severe harmful effect of the CUS on memory processing, but not the same as the control group. Whereas, exercise could not improve memory deficit in the CUS conditions. Moreover, exercise accompanied with crocin had not a synergic effect on enhancement of memory in unpredictable stress. Hence, it seems that memory improvement in the crocin-accompanied exercise was probably due to crocin, but not exercise, in unpredictable stress conditions. Further research is, however, required to shed more light on the possible mechanism(s) involved. Investigation of receptor regulation, assessment of involved biomarkers such as hormones and biochemical factors through which crocin might affect brain functions might be suggested for the future study. This work was supported by grants from Isfahan University of Medical Sciences, Isfahan, Iran. Radahmadi M, Dastgerdi HA, Fallah N, Alaei H. The effects of acute, sub-chronic and chronic psychical stress on the brain electrical activity in male rats. Physiol Pharmacol 2017;21:185-92. Roozendaal B. Stress and memory: Opposing effects of glucocorticoids on memory consolidation and memory retrieval. Neurobiol Learn Mem 2002;78:578-95. Campos AC, Fogaça MV, Aguiar DC, Guimarães FS. Animal models of anxiety disorders and stress. Rev Bras Psiquiatr 2013;35 Suppl 2:S101-11. Ji JF, Ji SJ, Sun R, Li K, Zhang Y, Zhang LY, et al. Forced running exercise attenuates hippocampal neurogenesis impairment and the neurocognitive deficits induced by whole-brain irradiation via the BDNF-mediated pathway. Biochem Biophys Res Commun 2014;443:646-51. Ghadrdoost B, Vafaei AA, Rashidy-Pour A, Hajisoltani R, Bandegi AR, Motamedi F, et al. Protective effects of saffron extract and its active constituent crocin against oxidative stress and spatial learning and memory deficits induced by chronic stress in rats. Eur J Pharmacol 2011;667:222-9. Azadbakht AA, Radahmadi M, Javanmard SH, Reisi P. The effects of doxepin on stress-induced learning, memory impairments, and TNF-α level in the rat hippocampus. Res Pharm Sci 2015;10:460-5. Li YH, Zhang CH, Wang SE, Qiu J, Hu SY, Xiao GL. Effects of Chaihu Shugan San on behavior and plasma levels of corticotropin releasing hormone and adrenocorticotropic hormone of rats with chronic mild unpredicted stress depression. Zhong Xi Yi Jie He Xue Bao 2009;7:1073-7. Asl NA, Sheikhzade F, Torchi M, Roshangar L, Khamnei S. Long-term regular exercise promotes memory and learning in young but not in older rats. Pathophysiology 2008;15:9-12. Radahmadi M, Alaei H, Sharifi MR, Hosseini N. Effect of forced exercise and exercise withdrawal on memory, serum and hippocampal corticosterone levels in rats. Exp Brain Res 2015;233:2789-99. Radahmadi M, Hosseini N, Alaei H, Sharifi MR. The effect of preventive, therapeutic and protective exercises on hippocampal memory mediators in stressed rats. Malays J Med Sci 2016;23:29-37. Dastgerdi AH, Radahmadi M, Pourshanazari AA, Dastgerdi HH. Effects of crocin on learning and memory in rats under chronic restraint stress with special focus on the hippocampal and frontal cortex corticosterone levels. Adv Biomed Res 2017;6:157. Hosseini N, Alaei H, Reisi P, Radahmadi M. The effect of treadmill running on memory before and after the NBM-lesion in rats. J Bodyw Mov Ther 2013;17:423-9. Radahmadi M, Hosseini N, Alaei H, Sharifi MR. Effects of stress on serum and hippocampal IL-1β and glucose levels as well as retention in rats. Indian J Physiol Pharmacol 2017;61:141-51. Roozendaal B, McEwen BS, Chattarji S. Stress, memory and the amygdala. Nat Rev Neurosci 2009;10:423-33. Eidelkhani N, Radahmadi M, Rafiee L, Gharzi M, Alaei H, Reisi P. Effects of doxepin on spatial memory, TNF-α and Bcl-2 family genes expression in rat hippocampus. Physiol Pharmacol 2015;19:185-92. Joëls M, Pu Z, Wiegert O, Oitzl MS, Krugers HJ. Learning under stress: How does it work? Trends Cogn Sci 2006;10:152-8. Sandi C, Pinelo-Nava MT. Stress and memory: Behavioral effects and neurobiological mechanisms. Neural Plast 2007;2007:78970. Smeets T, Otgaar H, Candel I, Wolf OT. True or false? Memory is differentially affected by stress-induced cortisol elevations and sympathetic activity at consolidation and retrieval. Psychoneuroendocrinology 2008;33:1378-86. McGaugh JL, Roozendaal B. Role of adrenal stress hormones in forming lasting memories in the brain. Curr Opin Neurobiol 2002;12:205-10. Pitsikas N, Sakellaridis N. Crocus sativus L. Extracts antagonize memory impairments in different behavioural tasks in the rat. Behav Brain Res 2006;173:112-5. Khalili M, Roghani M, Ekhlasi M. The effect of aqueous Crocus sativus L. extract on intracerebroventricular streptozotocin-induced cognitive deficits in rat: A behavioral analysis. Iran J Pharm Res 2009;8:185-91. Khalili M, Hamzeh F. Effects of active constituents of Crocus sativus L. crocin on streptozocin-induced model of sporadic Alzheimer's disease in male rats. Iran Biomed J 2010;14:59-65. Radahmadi M, Alaei H, Sharifi MR, Hosseini N. Stress biomarker responses to different protocols of forced exercise in chronically stressed rats. J Bodyw Mov Ther 2017;21:63-8. Alaei H, Borjeian L, Azizi M, Orian S, Pourshanazari A, Hanninen O. Treadmill running reverses retention deficit induced by morphine. Eur J Pharmacol 2006;536:138-41. Kang JS. Exercise copes with prolonged stress-induced impairment of spatial memory performance by endoplasmic reticulum stress. J Exerc Nutrition Biochem 2015;19:191-7. Cotman CW, Berchtold NC. Exercise: A behavioral intervention to enhance brain health and plasticity. Trends Neurosci 2002;25:295-301. Rizi AA, Reisi P, Naghsh N. Effect of forced treadmill exercise and blocking of opioid receptors with naloxone on memory in male rats. Adv Biomed Res 2016;5:20. Radahmadi M, Alaei H, Sharifi MR, Hosseini N. The effect of synchronized forced running with chronic stress on short, mid and long- term memory in rats. Asian J Sports Med 2013;4:54-62. Liu J, Yeo HC, Overvik-Douki E, Hagen T, Doniger SJ, Chyu DW, et al. Chronically and acutely exercised rats: Biomarkers of oxidative stress and endogenous antioxidants. J Appl Physiol (1985) 2000;89:21-8. Suzuki K, Totsuka M, Nakaji S, Yamada M, Kudoh S, Liu Q, et al. Endurance exercise causes interaction among stress hormones, cytokines, neutrophil dynamics, and muscle damage. J Appl Physiol (1985) 1999;87:1360-7. Meeusen R, De Meirleir K. Exercise and brain neurotransmission. Sports Med 1995;20:160-88. Ghorbanzadeh V, Mohammadi M, Dariushnejad H, Chodari L, Mohaddes G. Effects of crocin and voluntary exercise, alone or combined, on heart VEGF-A and HOMA-IR of HFD/STZ induced type 2 diabetic rats. J Endocrinol Invest 2016;39:1179-86. Berchtold NC, Castello N, Cotman CW. Exercise and time-dependent benefits to learning and memory. Neuroscience 2010;167:588-97.